Our flight was very early on Wednesday morning so we left home at 2:40 p.m and headed to Syracuse for an overnight stay at the Best Western Hotel beside the airport. There was no line at border and we crossed into the US at 3:10 p.m.
Our first stop was Watertown New York. I dropped Carol off at the Cracker Barrel then went to the Home Depot next door. 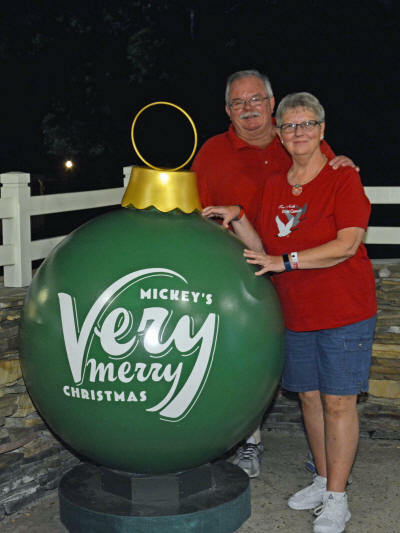 I picked up some parts for the Mickey Mouse lamp posts I build, by the time I picked Carol up she had purchased a couple of Christmas gifts. By 5:00 p.m. we were in Cicero New York and stopped at Wal-Mart. Carol picked up a few groceries, then we stopped again at Home Depot. The Watertown store didn’t enough parts for the 6 lamps I’m planning to build, so I picked up the pieces I still needed in Cicero. We checked into the Best Western Hotel beside the Syracuse Airport at 6:30 and almost immediately carried on to Syracuse where we stopped at the Destiny USA Mall. 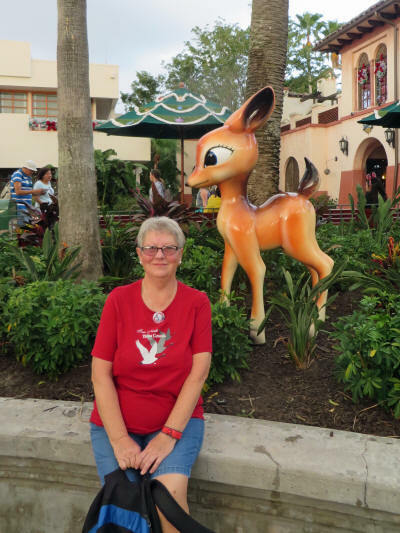 Carol scoured the Disney Store while I sat with the children watching cartoons, then we went to the nearby Cheesecake Factory for a delicious dinner. Our last stops were at J.C. Penny and the Christmas Tree Store. There was nothing Carol needed or wanted in either store. Yup . . . I was surprised too! We were back to the hotel at 8:50, watched a bit of TV and crashed early after a busy day. Our plans for a good night’s sleep were dashed by a bed that was much smaller and much softer than we’re used to! I toss and turn a lot in my sleep - almost constantly. My motion and the softness of the bed drew us both into the center of the bed, where Carol spent most of the night bouncing and rolling on top of me. On this particular night that was neither where she wanted to be nor what she wanted to be doing! I slept fitfully; Carol slept warily! The alarm was set for 5:00 a.m. I sensed that Carol was awake; she sat up and I asked, “What time is it?” She said, “it’s 4:57.” The lights went on and she had just started coffee when I heard “Oh drat.” (or words to that effect). It was 2:00 a.m. We fell back to sleep to the gurgling sound of the coffee maker. When the alarm finally woke us at 5:00 a.m. everything went like clockwork. We got to the lobby just as the airport shuttle was loading. By 6:00 a.m. we had cleared security and were having breakfast beside our departure lounge. Our flight left 15 minutes late and landed 15 minutes late but it was smooth flying all the way. 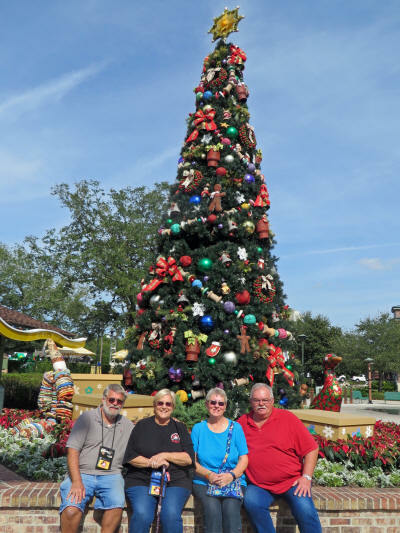 Our suitcase was in the first dozen to hit the carousel and we were in our rental car driving out of the Orlando airport by 11:00 a.m.
We headed directly to Disney Springs where we renewed Carol’s AP and activated my 7-day pass then at noon headed toward Earl of Sandwich for lunch. Carol stopped at Pin Central and bought some pins while I took a few pictures then she stepped into the line at Earls to get our sandwiches while I guarded a cool indoor table for us both. It was 83° outside, quite a change from home! Not long after Carol joined the sandwich line a familiar face passed me by in the seating area. It was our friend Jane from Missouri. Al was in line for sandwiches, not far behind Carol. We joined the two of them at a table for 4 and had a nice visit. We hadn’t seen them since last Halloween. 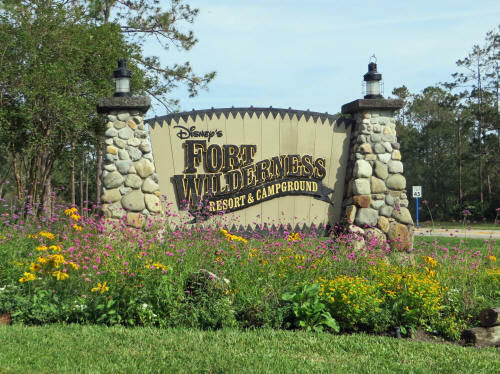 After a nice visit with our camping buddies Al and Jane we stopped at Fort Wilderness Resort and Campground. We had brought along a few Canadian goodies for another friend, Hilda. She wasn’t home, we hope to catch her another time! 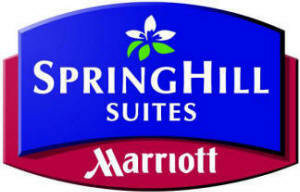 From there we drove straight to the Springhill Suites by Marriott at Flamingo Crossing. This will be our home for the next week. We checked in at 2:30 p.m. and spent a bit of time getting settled. 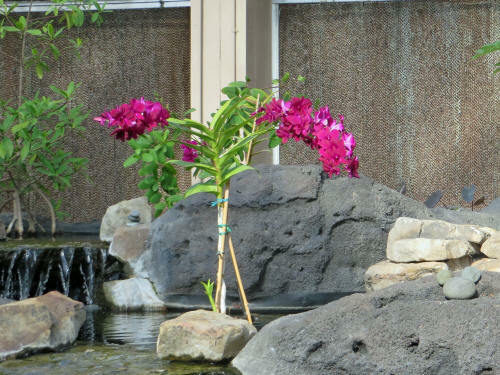 It’s a lovely place and the price is great compared to Disney owned resorts. We left for the Magic Kingdom at 4:15 and parked at the Polynesian Village Resort. 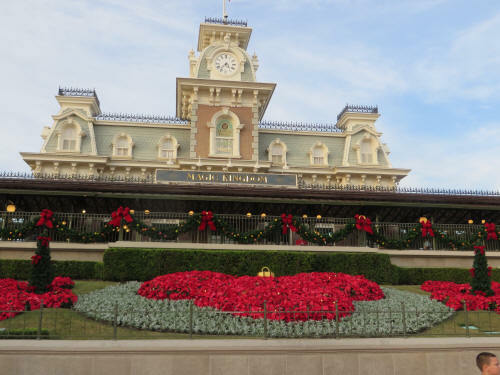 We went directly to the monorail and entered the Magic Kingdom at 4:45 p.m. 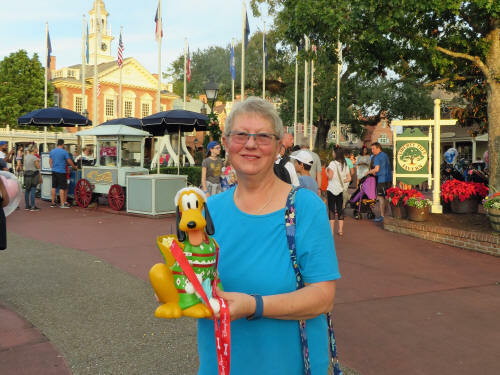 Naturally we had to stop at the Fire Hall for Sorcerer Cards and watch a bit of the 'Move It - Shake It' dance party, then Carol went to Heritage Hall and picked up her Annual Passholder MagicBand. As we passed through Liberty Square she spotted a popcorn bucket she was hoping to find so it will be flying home with us! 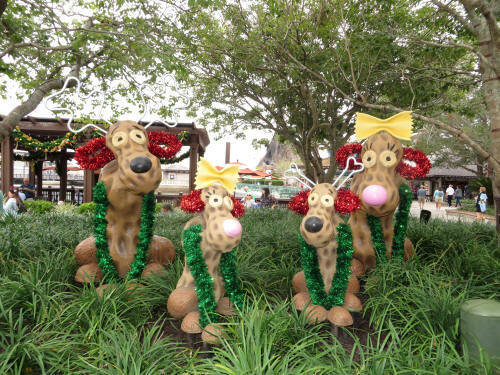 We used our FastPass+ to ride Pirates of the Caribbean and then took a quick peek at the Jingle Cruise. 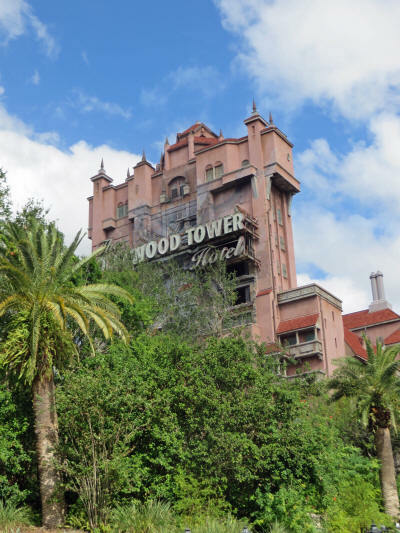 Yikes - the standby line was 70 minutes long . . . no time for that today! 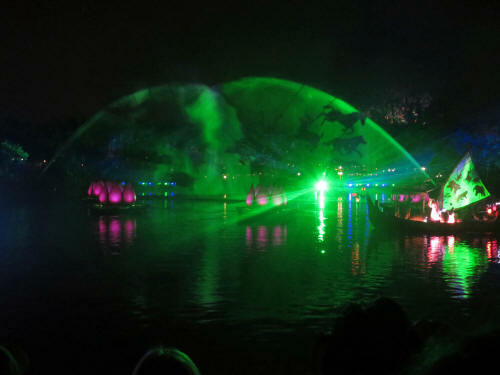 We carried on to Peter Pan’s Flight where we cashed in our second FastPass+. By then it was time to be heading back to the Polynesian for dinner at ‘Ohana. 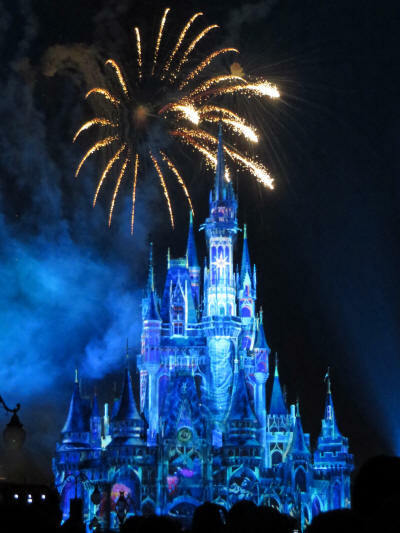 As we walked alongside Cinderella Castle, near Sleepy Hollow, the nightly castle lighting ceremony began, so we stopped for a few minutes to watch it. It really is a beautiful transformation. As we passed City Hall Carol popped in and picked up a copy of the Mickey Monitor. It’s a quarterly magazine for Annual Passholders that the corporation mails out to all passholders in the USA. Alas, the corporate bean-counters are much too frugal to spend the extra 20 or 30 cents to mail it to Canada. We got to the Polynesian at 7:10, just in time for our dinner reservation at ‘Ohana. As always, it was yummy! It was 8:20 when we caught the monorail back to the Magic Kingdom. 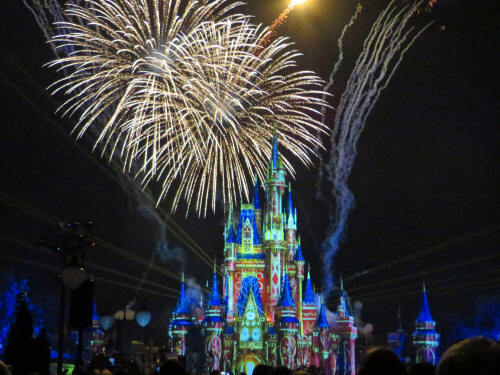 We dashed hobbled up Main Street and ducked under a rope in front of Casey’s to watch the new ‘Happily Ever After’ fireworks and castle illumination show. It’s really hard to explain how AWESOME the show is. 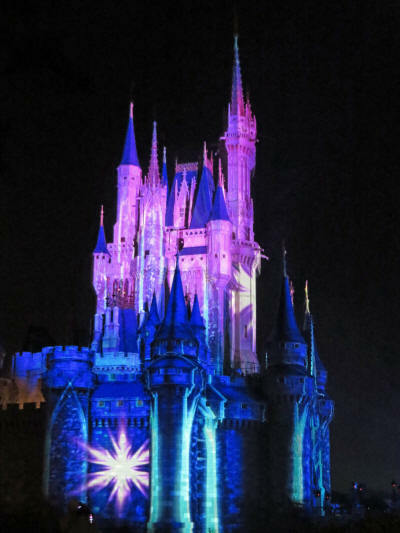 They use projected light to totally transform Cinderella Castle. 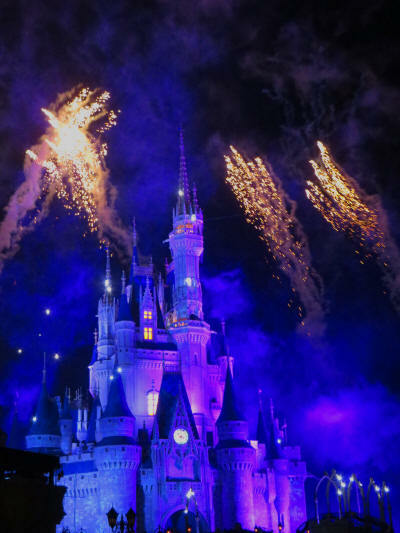 It changes colour, Disney characters perform on it’s surface, at one point one of the turrets transforms into a rocket ship that blasts off. 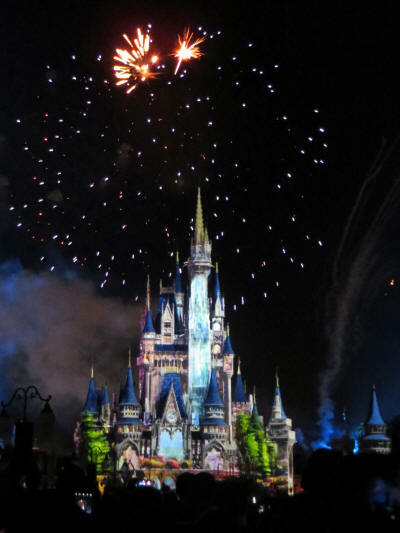 It’s all choreographed to Disney music and accented by a lavish fireworks show. Words cannot possibly do it justice . . . I hope these pictures Carol took will help! By the time it was over we were both pooped. We waited a few minutes for the crowd to disperse then headed home. We were back at the Marriott at 10:30. Bed time will come early . . . I expect that I’ll sleep well, but Carol may still be a little wary! We were both up early. I woke at 5:15 and couldn’t get back to sleep. I turned on the desk light over the computer at 5:30 and heard a loud grumble from Carol’s side of the bed. It wasn’t long before she decided to get up and punish me by making me a coffee. By 7:15 a.m. I had our blog all written, assembled, approved by my editor-in-chief, and uploaded. Then it was time for breakfast. They serve a nice complimentary hot breakfast just off the lobby. I was finished and just preparing a hot coffee to take back to the room to Carol when she appeared in the breakfast room. She was ready to go, so we hopped directly in the car and made tracks. We were parked at Animal Kingdom by 8:30 and walked directly back to the entrance at Pandora. Within just a few minutes the line started to move slowly. 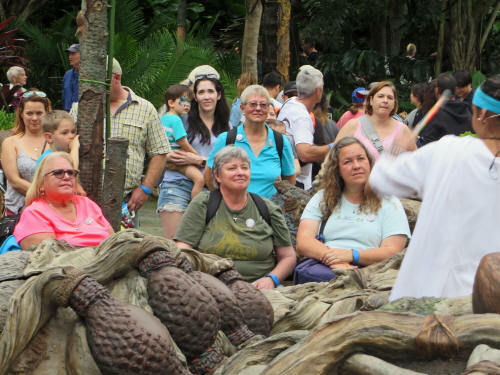 We wound and wove through the newly opened area of the park which gave me time to check out all the new “otherworldly” creations built into the foreign looking land. It really is amazing! Although we had a 75 minute wait before our ride on ‘Avatar Flight of Passage’ it seemed to pass quickly. The line seldom stopped for more than a few seconds at a time, and there was always something new to look at. Finally we arrived at the pre-loading area where we were sprayed to neutralize some parasites, genetically matched with our avatars and cleared for our mission. We processed into an adjoining room to board our banshees and take flight. All I can say about the experience is WOW! Just WOW! Carol described it to me last August as ‘Soarin’ on steroids’ and I can think of no better words. It captures all of your senses as you soar, plunge, reel and careen through your flight on the back of a banshee. WOW! I can’t wait to do it again tomorrow! 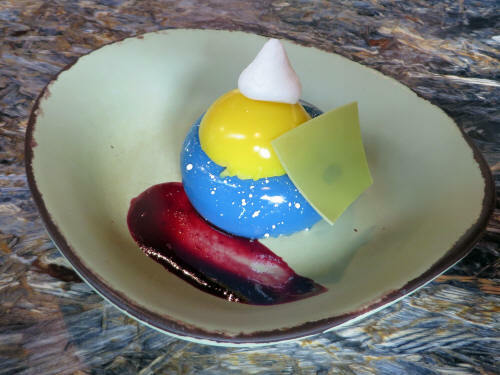 We stopped for a few minutes at Satu’li Canteen where we shared a children’s chicken bowl and a blueberry cheesecake. Both were tasty. 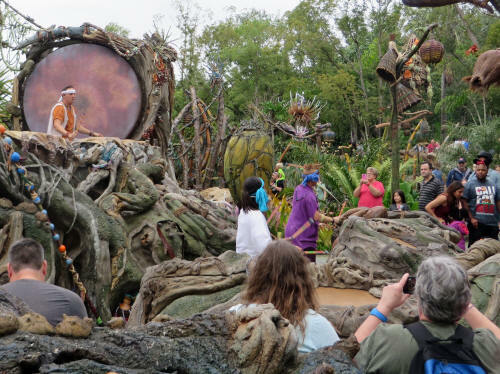 Then it was time for our Na’vi River Ride. We arrived just in time for our 10:55 FastPass+. 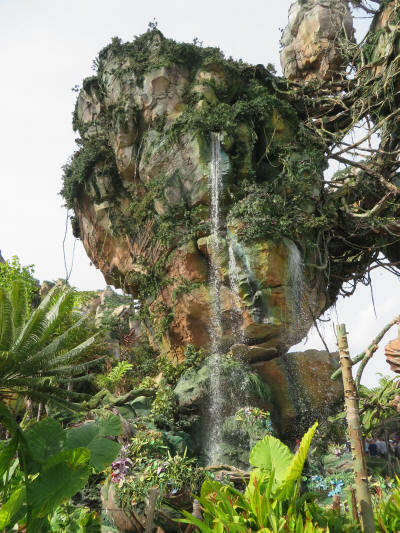 It is a very entertaining boat ride through some of the exotic areas of Pandora. 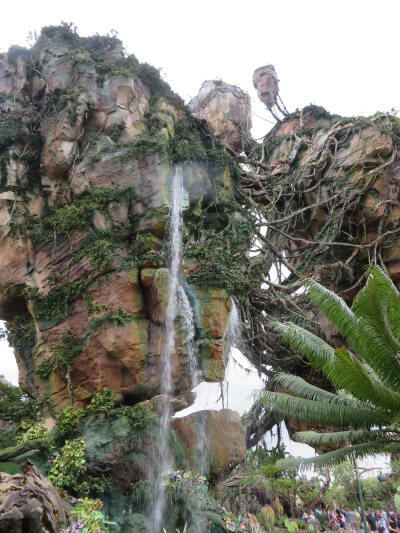 While it’s not as exciting or dramatic as Avatar Flight of Passage, some of the scenes, audio-animatronics and projections were simply breathtaking. It’s another ride I can’t wait to repeat. 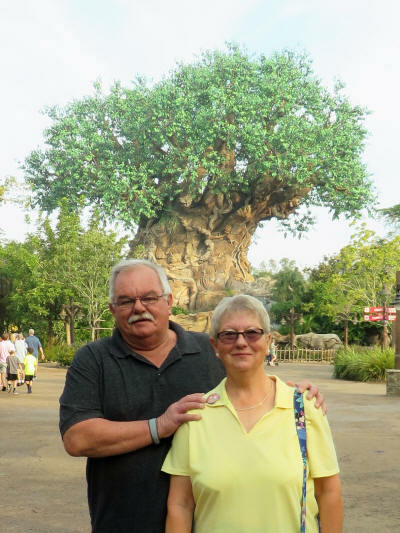 We left the land of Pandora through the newest gateway, near the Festival of the Lion King theatre and, after pausing for a Mickey bar, headed straight to the tour booking kiosk near the entry to Kilimanjaro Safaris. 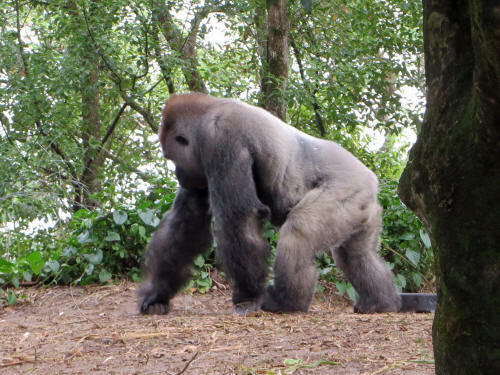 We were hoping to book a ‘Caring For Giants’ tour sometime that same afternoon. We were in luck, there was a tour going at 12:30 - we only had 45 minutes to wait. I found a quiet spot to sit nearby while Carol passed her time in a few shops. She came back with a cheese and cracker snack which we shared before heading backstage for our tour at 12:30. There were only seven people in our tour group. 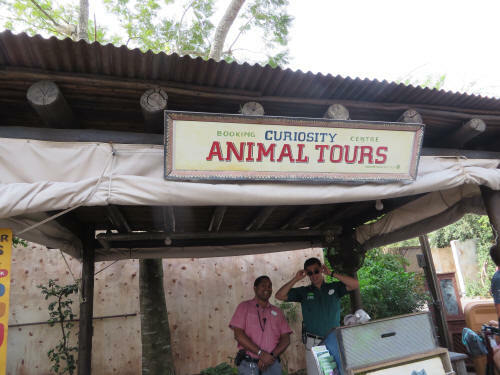 We boarded a small bus and took a trek along Perimeter Road, the road that runs all the way around the Animal Kingdom Park. The driver explained the various barns and zoo facilities we passed on the way and pointed out the huge berm of sand that prevents the outside world from impacting the unique habitats that Disney Imagineers have created for the animals who live in the park. Soon we turned off Perimeter Road and drove a few hundred yards into the park where we stopped at our preferred observation point. 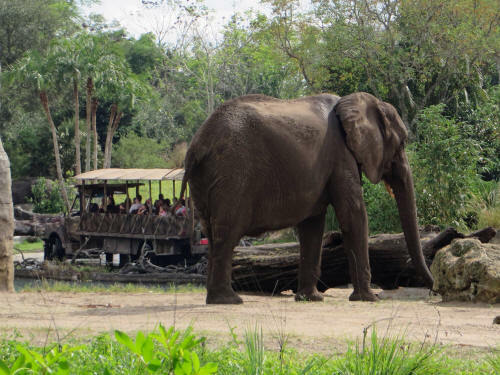 The driver handed us off to two guides, one from Pennsylvania and the other from Zimbabwe. 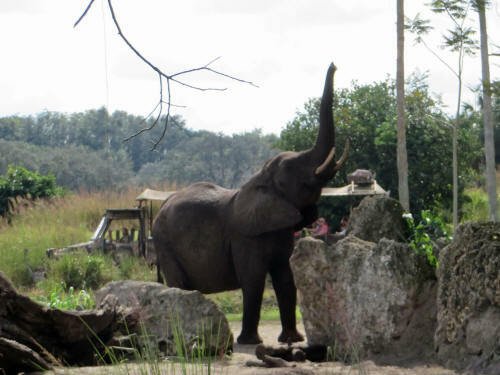 If you were on the Kilimanjaro Safari Ride and you stopped to see the elephants, just before you got to the flamingos on that little island, you may have seen us. 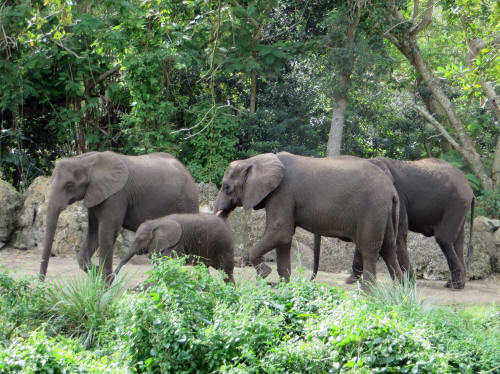 We were behind the elephants, not more than 25 yards from their habitat. We spent over a half hour watching the elephants parade past us as the two guides/interpreters told us the name of each giant beast and described the unique personality that each of them displays to their keepers. 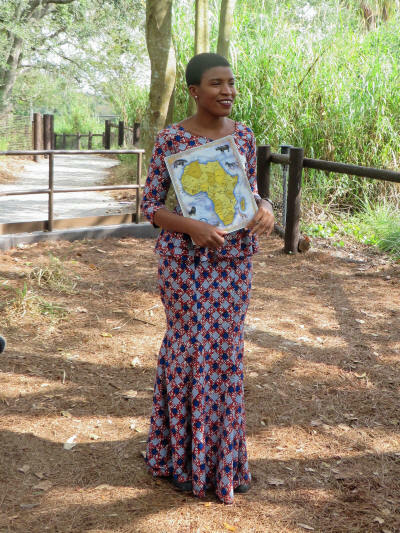 The young lady from Zimbabwe told us of the struggles the elephants face in Africa. In her home country unemployment is estimated at 85% and people will do almost anything to feed their families . . . including poaching. 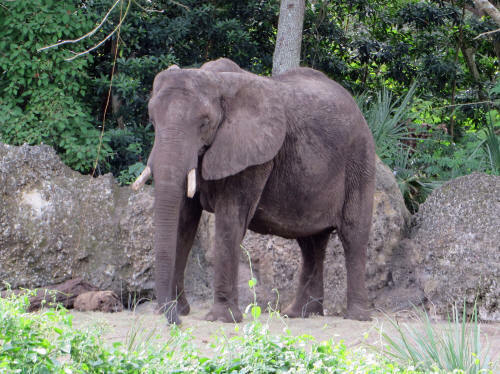 She described some of the unique ways that are being used to protect elephants from their most dangerous predator - humans! 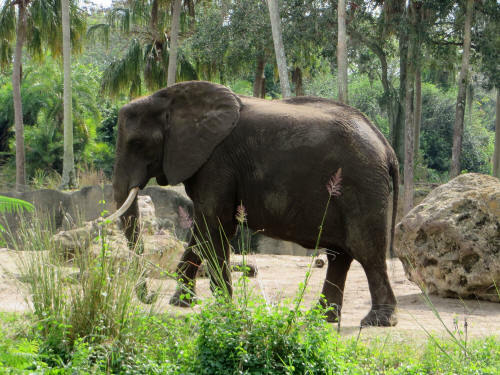 The guides described the diet of the Disney elephants. They eat a lot of food but they don't digest it very well. 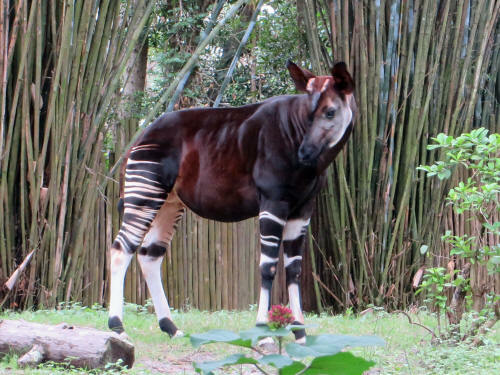 Their poop is very fibrous . 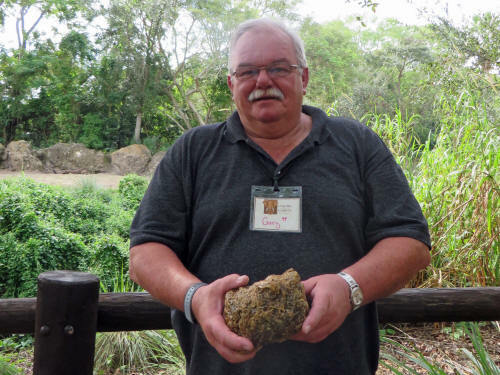 . . look to the right - that's a big chunk of fibrous elephant poop in my hands! The name badges we wore during the tour are made from fibres out of elephant poop. The back of the tags certifies that they are 85% elephant poop. That's something you don't see every day! It was a fascinating hour, well worth the $25.00 cost. Carol and I highly recommend it! 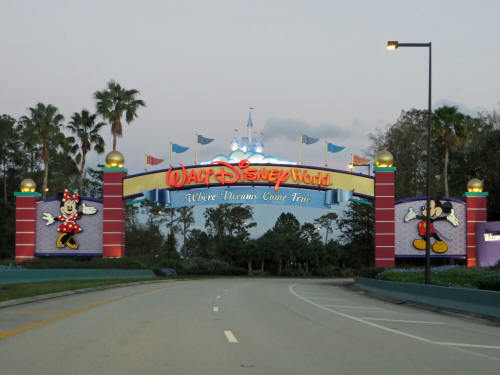 After the tour we headed to the parking lot and by 2:30 we were on the road headed to Fort Wilderness. 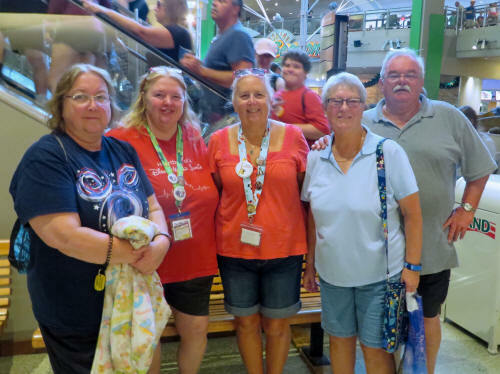 Carol popped into the Meadow Trading Post and picked up some pins that had just been released that day, then we carried on to Winter Garden to drop in on our friends Diana and Tom at TD Collectibles. It was a successful mission . . . Not only did we have a nice visit with Diana, but Carol picked up a Disney Classic Collection piece and a few trading pins. I found a nice stack of old Eyes and Ears (Disney Cast Member newsletters). On our way out of Winter Garden we stopped at Chik-Fil-A for a snack. We don’t have them in Canada - sure wish we did! We were back home at 4:45 and put our feet up for a few minutes rest! Our rest came to an end sooner than either of us would have liked. 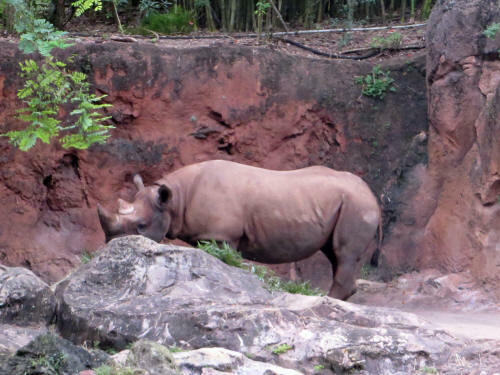 At 5:45 we hopped in the car for our return to Animal Kingdom. 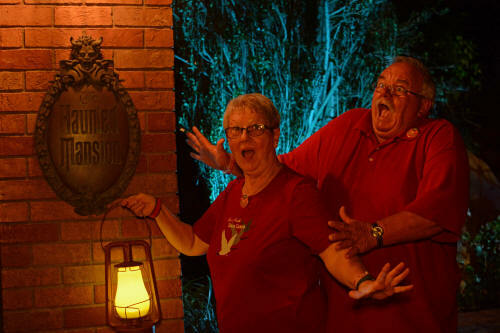 We had FastPass+ for the 7:45 Rivers of Light show and wanted to use the single rider’s line to take a spin on Expedition Everest before we entered the amphitheatre along the side of the river. 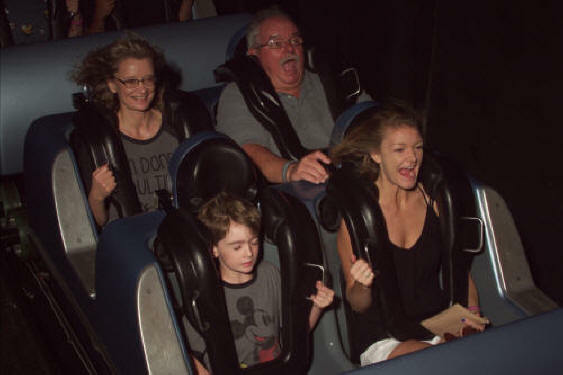 Alas, Expedition Everest wasn’t operating when we got there. They expected that it would be ‘down’ for more than an hour! All was not lost though, we walked back to Yak & Yeti where we enjoyed a couple of egg rolls, then went back and joined the line in front of the amphitheatre. 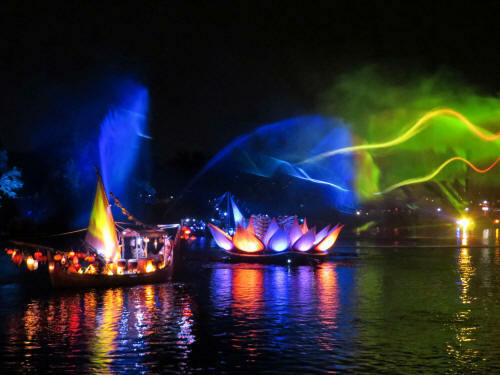 It was a very entertaining show, bright coloured boats and floats, illuminated water fountains, projections on screens of water and a captivating story all set to music. We both thoroughly enjoyed it. 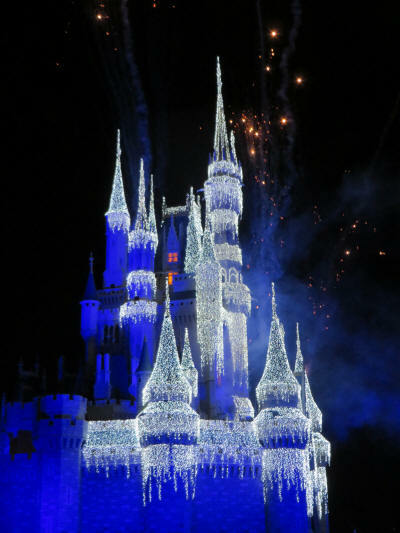 It’s not a show we will want to see every time we visit, but certainly we’ll watch it every few years! After the show we were both worn out from the heat of the day (89°) but we weren’t sure we’d have a chance to see Pandora at night any time soon so we ‘sucked it up’ and walked all the way across the park to the exotic new land. It was well worth the effort. 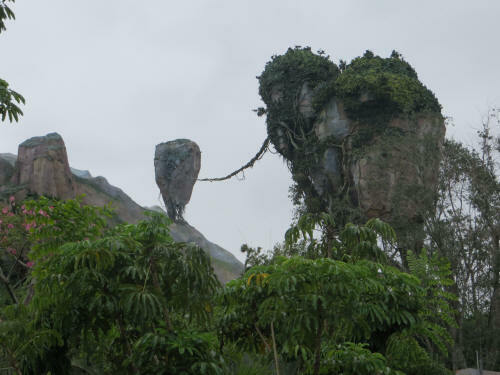 In the Avatar movie much of the plant life on Pandora is bioluminescent and the Imagineers have done a great job replicating it. 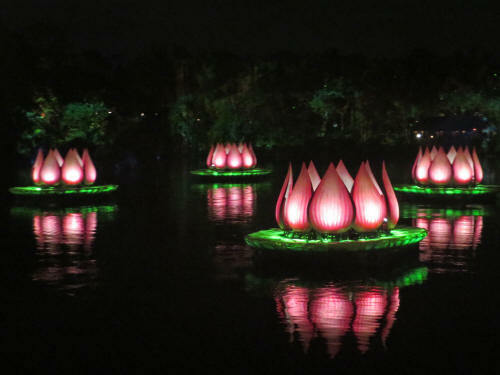 The area is aglow at night, very captivating! 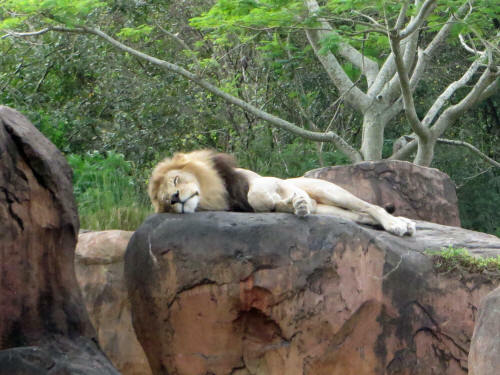 After a slow lap around the newest area in the Animal Kingdom Park we called it a day and dragged our beaten and battered feet and legs out to the parking lot. We were home about 9:00 p.m. and started resting up for another big day tomorrow. We both slept until 7:00 a.m. . . It felt good! 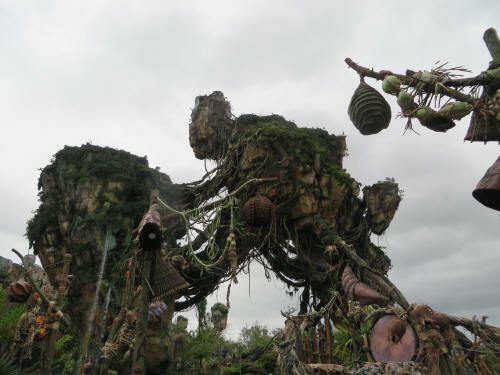 By 8:30 we were on our way back to Animal Kingdom for another exciting day in Pandora. 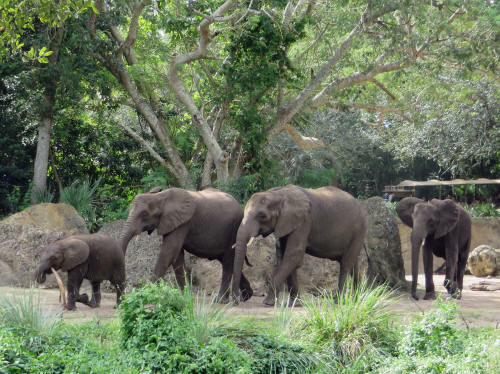 When the park opened at 9:00 and everyone raced into the Valley of Mo'ara to ride the newest attractions, we headed to Africa. 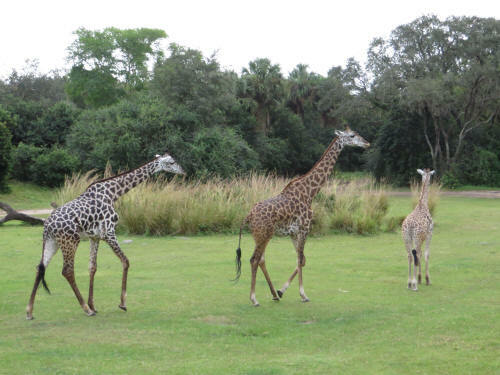 There was no line at all for Kilimanjaro Safaris and we had a great ride. 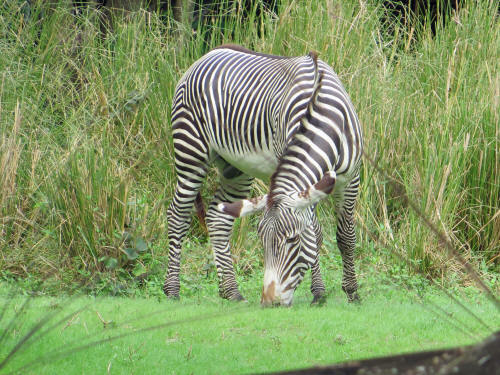 The animals were plentiful and Carol captured some great shots! 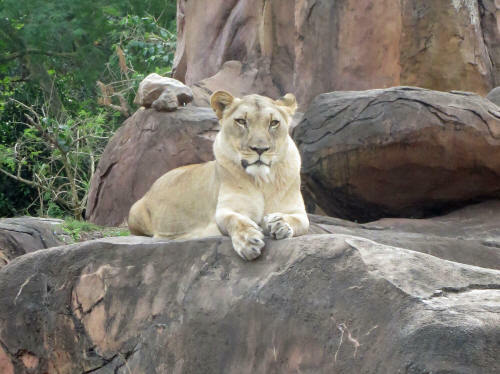 After our safari we walked across to Asia and used the single rider line to take a spin on Expedition Everest. 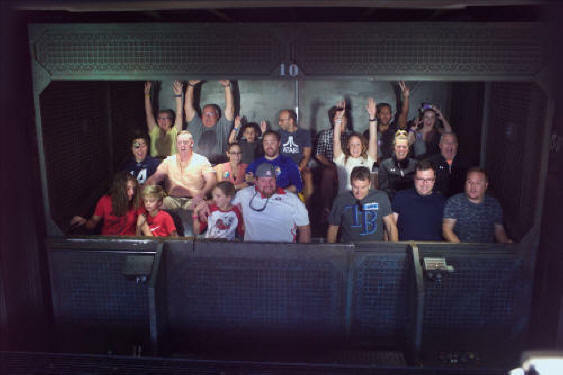 We like the single rider line, we don’t ride together, but it saves a lot of time! By 10:45 we were headed toward the Valley of Mo'ara in Pandora. 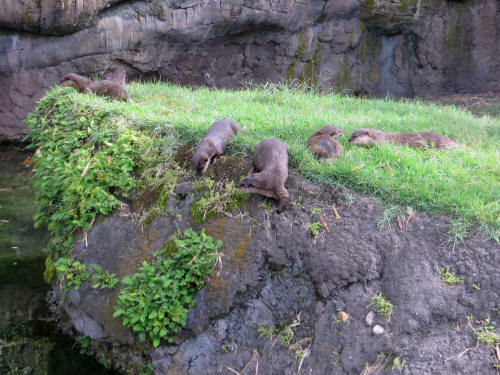 We were sidetracked along the way when Carol spotted a romp of otters at play! There were eight of them running, rolling and splashing. Carol is a sucker for otters, I think she could stand and watch them all day! We had a FastPass+ for Avatar Flight of Passage so I was able to drag Carol away from the otters after about 15 minutes! 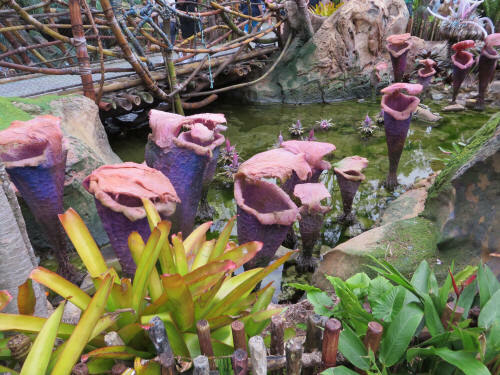 In just a few minutes we were in the Valley of Mo'ara where we were genetically matched with our mountain banshees in no time we were flying through the alien terrain of Pandora. Once again it was a WOW! I noticed things on my second ride that I hadn’t seen the first time through. Carol said it was the same for her . 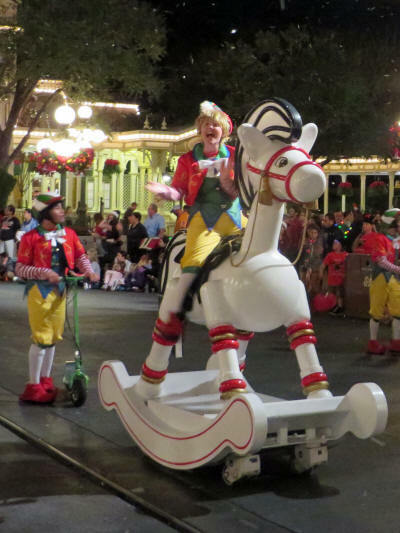 . . it was her seventh ride, but she still picked out new details! 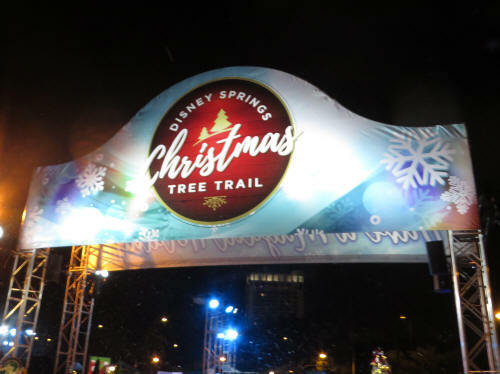 We left the park about noon and headed to Disney Springs. Carol picked up a few newly released pins, some for herself and some for friends back home. Then we walked over to Earl of Sandwich for lunch. Can you tell that we like it at Earl’s? They have elevate sandwiched to an art form. 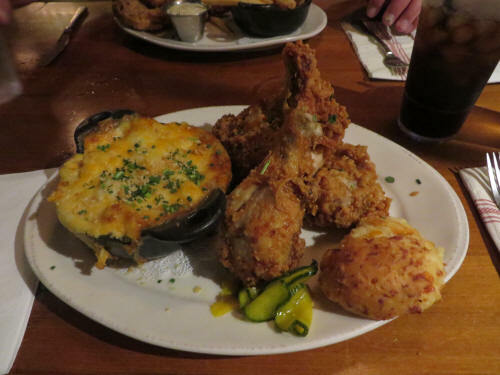 We have simple tastes and Earl’s is our idea of haute cuisine! On the way back to our hotel for a rest we stopped at Property Control. 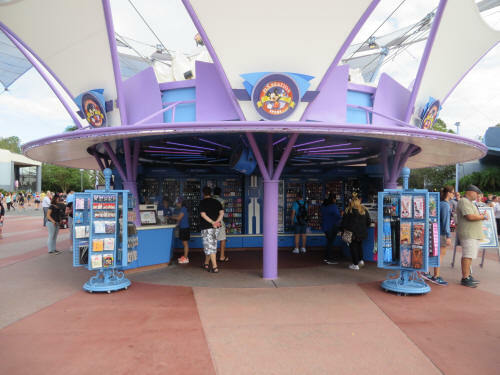 It’s a special store where Disney offers overstocked merchandise, dated items and seasonal stock to employees and vendors at reduced prices. You never know what to expect there, the inventory changes quickly and is always unpredictable. Carol found a few trinkets, but not very much caught her eye this time! 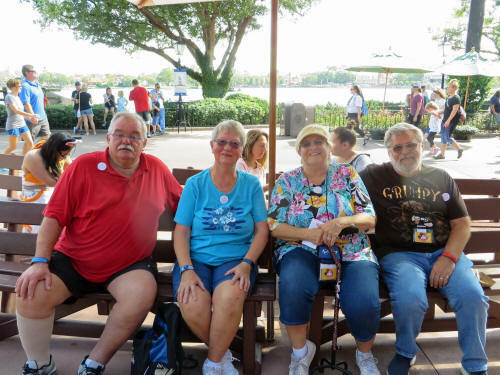 One good thing about our stop there was that we bumped into our friend Hilda from Fort Wilderness Campground and had a nice chat with her. We were back to our hotel by 3:15 . . . Carol got caught up on her messages and correspondence while I had a well earned nap! 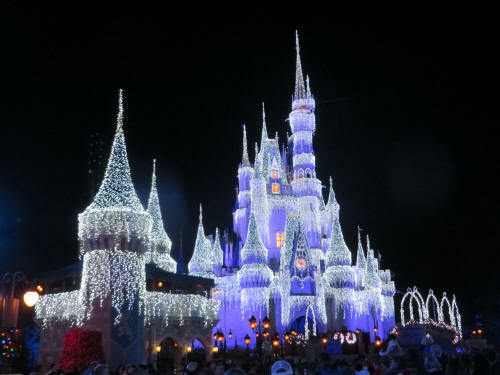 At 5:00 p.m. we struck out again; our destination was The Magic Kingdom. 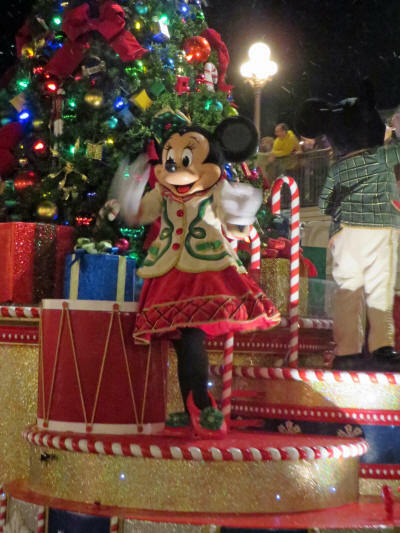 We had tickets for Mickey’s Very Merry Christmas Party. 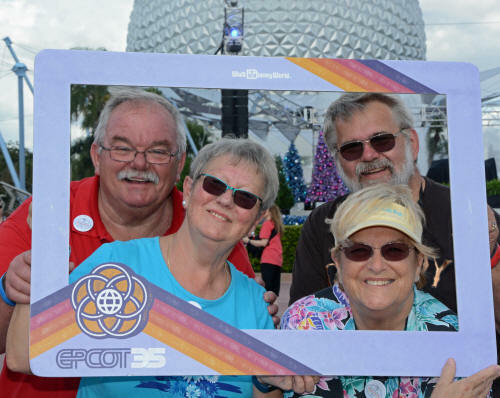 Our first task was at the Fire Hall where we picked up Sorcerer Cards, then Carol moved on to the Emporium where she picked up party pins and a few other trinkets while I did some people watching at Casey’s Corner. 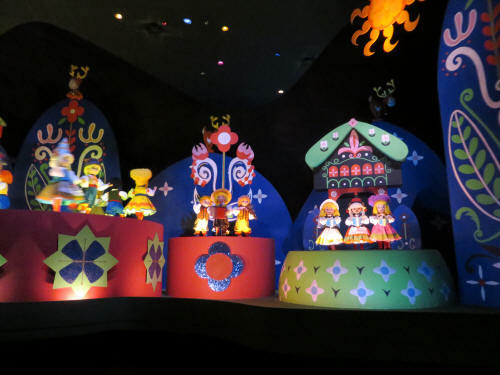 We checked the line at the Seven Dwarfs Mine Train, it was much too long so we walked over to It’s A Small World. There was a long line there as well, but we had a FastPass+. There was virtually no line at Voyage Of The Little Mermaid so we took a quick ride there before our 7:00 p.m. dinner at Be Our Guest. Dinner was very good, as usual. Carol had her favourite dish, the steak. I was adventurous and skipped the chicken I usually have; I tried the shrimp and scallops dish instead. It was delicious, I’ll probably have it again next time. After dinner we wandered over to Mickey’s StorybookLand to see if there were any characters at the Big Top. That didn’t work out, the big top was closed and there was huge line nearby for photos with Snow White and the Seven Dwarfs. We bypassed that and headed to Tomorrowland. 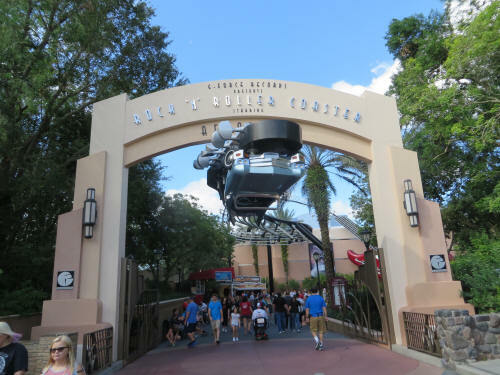 Buzz Lightyear’s Space Ranger Spin was a walk-on. 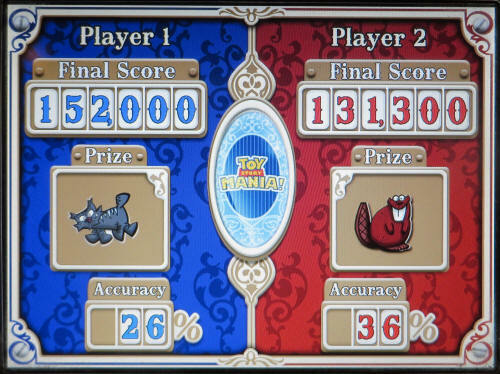 We were both pretty rusty and each of us had a lousy score! We watched a live show at the Rockettower Plaza Stage. 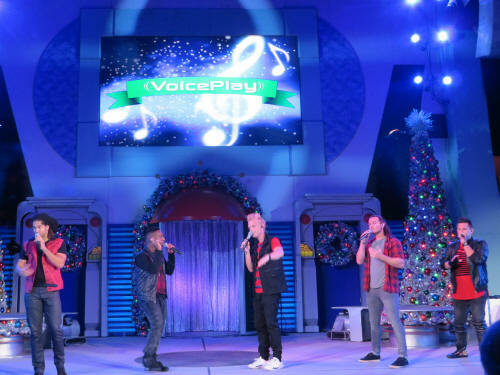 An a cappella group named VoicePlay presented some very harmonious, and often humorous, Christmas music. We took a few minutes to enjoy a very quiet lap around Tomorrowland on the WEDWay People Mover before taking a hike through The Hub toward Liberty Square and the Haunted Mansion. The cookies and apple cider at Pinocchio Haus were beckoning as we passed by, so we stopped for a quick treat! After our Doom Buggy ride with the 999 Happy Haunts we paused for a few special photo-ops. We wandered across to Adventureland and got in line for the Jingle Cruise but it soon became apparent that we would not be done in time to enjoy the 10::00 p.m. Holiday Wishes fireworks show. 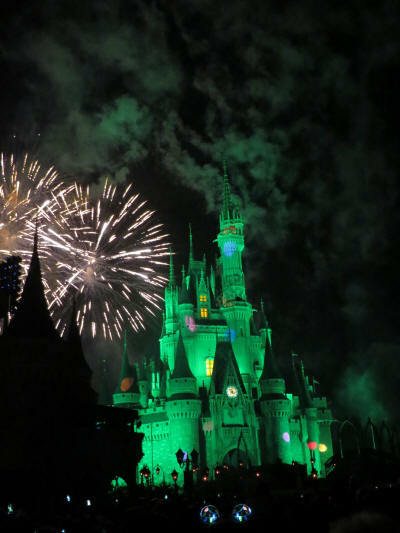 We walked upstream out of the queue and headed for The Hub where we found a good spot in front of Cinderella Castle to watch the show. 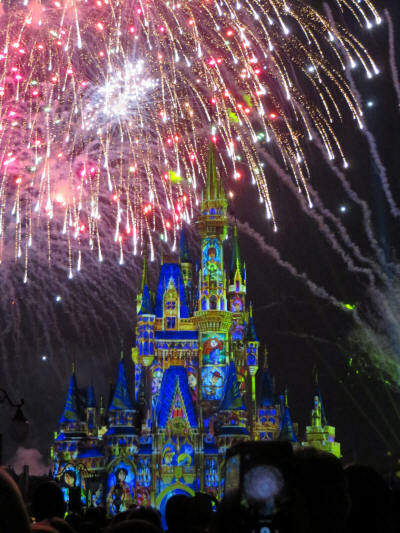 Disney fireworks always set the bar high and Holiday Wishes is one of our favourites. It was great! After the fireworks we slowly made our way from The Hub to Town Square. Carol poked around a few shops while I reserved us a spot on a bench in front of the train station. 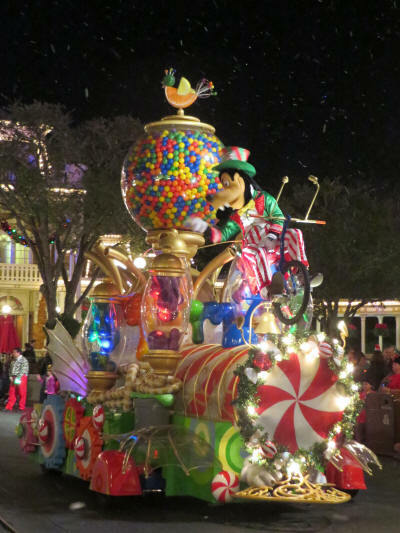 It was the perfect spot to watch the 11:00 Once Upon A Christmastime Parade. When the parade was finished at 11:45 we were finished too! We dragged our weary bones to the car and were home at 12:15. Zzzzzz! 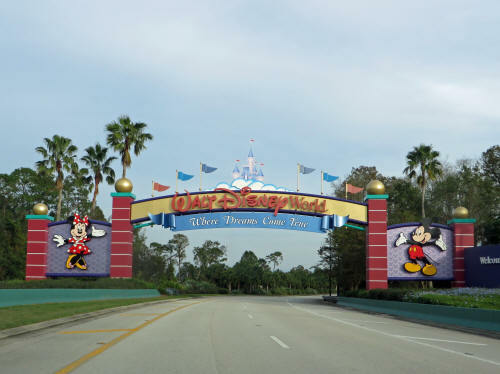 It was another sleep-in day; we both slept until 7:15 a.m. By 9:15 we were in the car heading to Hollywood Studios. As we walked up Hollywood Boulevard at 9:30 a cast member asked us to step onto the sidewalk . . . the March of the First Order was about to begin. We found a good spot on the curb to get a few pictures. Once the storm troopers had passed we turned onto Sunset Boulevard heading toward the Tower of Terror. One of the streetmosphere performers came out of nowhere and demanded a picture with me. Since I’m one of those always congenial Canadians I just had to oblige her! 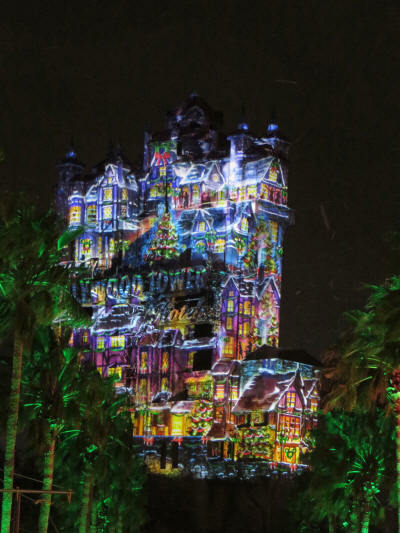 There was quite a 50 minute standby line at Tower of Terror and we were thankful to have FastPasses. 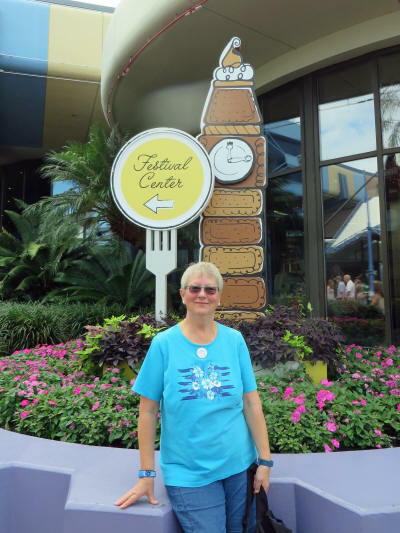 Once we were done our bobbing and plunging, Carol wandered a few shops while I used the single rider line at Rock ‘N Roller Coaster. We stopped at the corner of Hollywood and Sunset and picked up a carrot cake cookie which we shared outside the closed and shuttered Starring Rolls coffee and snack shop. 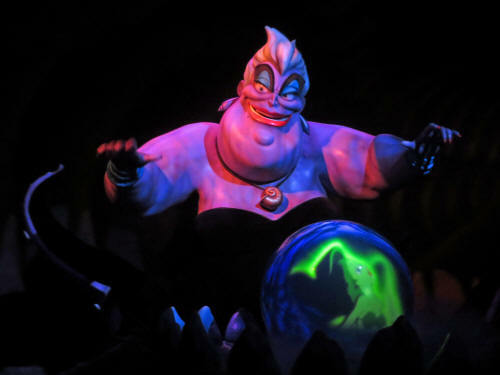 Starring Rolls was great and it was always busy, sometimes I just cannot understand what Disney management is thinking! 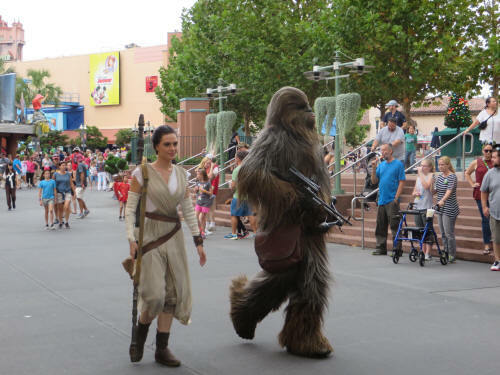 We started on our way to Pixar Place when we were once again passed by some Star Wars characters. 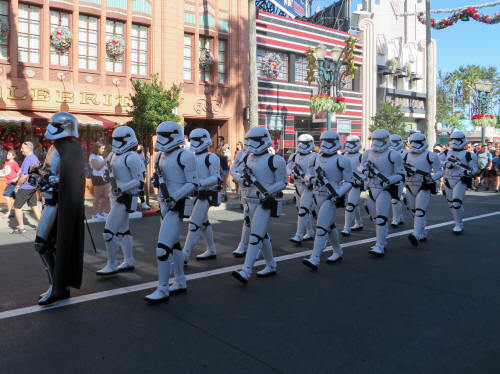 This time they were heading to the stage in front of the Chinese Theatre where they put on several performances of ‘Star Wars: A Galaxy Far, Far Away’ each day. We took in the Coco preview in the One Man’s Dream Theatre. It’s an animated feature film starring Coco, a young Mexican boy and his dog Dante. It looks great, it’s one we’ll probably try to see at the movies rather than wait until it comes out on DVD. Our final attraction of the morning was Toy Story Midway Mania. 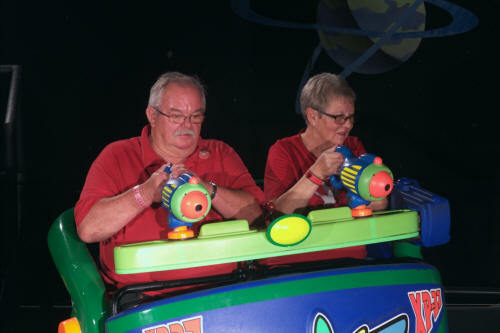 Just like Buzz Lightyear, we were both rusty and had poor scores. I don’t think we’ll get back there again this trip so we won’t have a chance to hone our skills! On our way to the exit we stopped at Min & Bill’s Dockside Diner and shared a foot-long hot dog, then left the park at 1:50. We were back at the hotel by 2:00 p.m. and by 2:15 we were both snoring gently! After a couple of restful hours we made our way back to Hollywood Studios and made our way to the newly renovated Muppets Courtyard. Only a few of the original buildings remain as almost the entire area surrounding the Muppets 3D Theatre transforms into Star Wars Land! We checked in at 50’s Prime Time Café just a few minutes before our 5:05 dinner reservations and were seated almost immediately. We always enjoy 50’s Prime Time, the food is good and it’s an entertaining environment. After dinner we walked up Sunset Boulevard hoping to see a bit of ‘Sunset Seasons Greetings’. 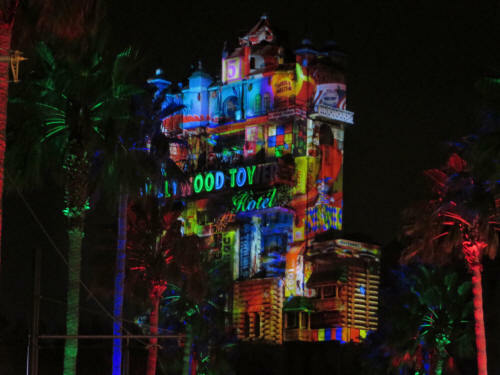 It’s a brand new projection show that transforms the Tower of Terror each night. It premiered to the public jut two days earlier, on November 9th so it’s very new and fresh. The show began at 6:15 and we were able to see a very short bit of it before we had to leave to get to our 6:30 Dessert Party. We knew that we would be back to watch the entire show once our party was over! Our dessert party was held in the courtyard in front of Grauman’s Chinese Theatre. 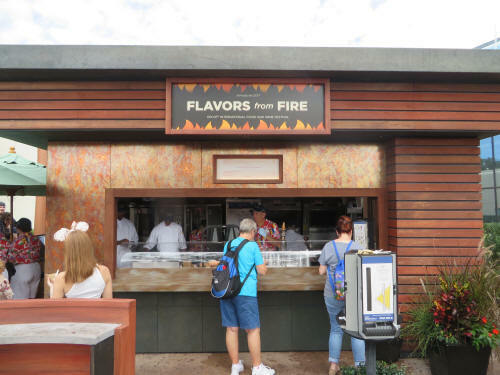 The area was cordoned off for a group of us who had paid $79.00 each for a buffet of drinks, savoury snacks and sweet desserts before being led to a private viewing area for the ‘Jingle Bell, Jingle Bam!’ show. 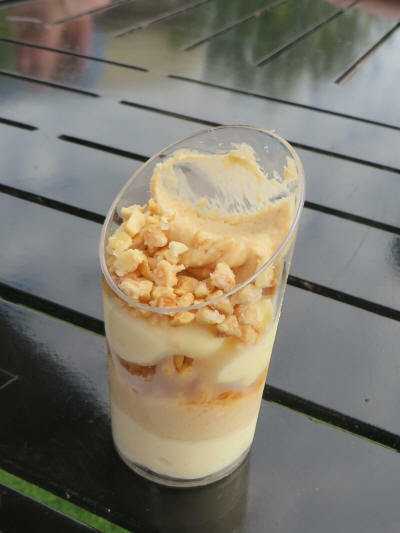 Although we enjoyed the drinks, the buffet and the chance to chat with other die-hard Disney fans, we were disappointed that the package did not include seating in the preferred viewing area. We had to stand or sit on the concrete for the performance. I think that they could have found some folding chairs for the 100 to 125 of us who paid handsomely to be there. The show itself was outstanding. Prep and Landing rescue Santa Clause from Lock, Shock and Barrel and save Christmas once again! 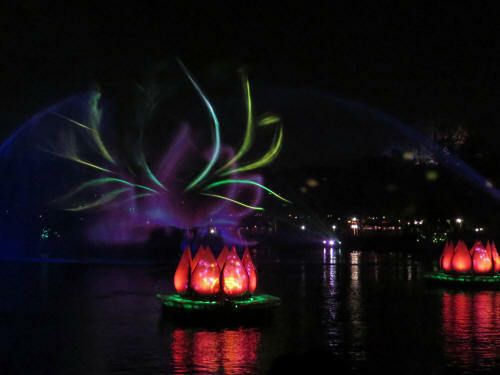 It’s a spectacular blend of animated projection, music, lasers and fireworks. We thoroughly enjoyed it! 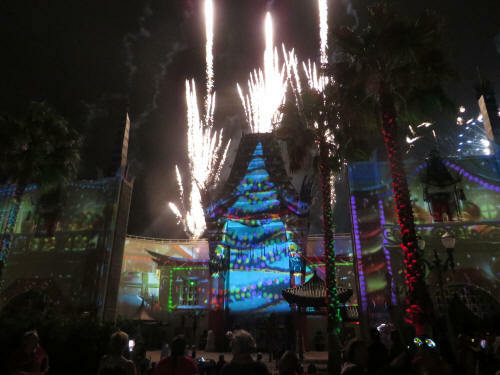 After the ‘Jingle Bell, Jingle Bam!’ show concluded we waited a few minutes to let the crowd dissipate, then returned to Sunset Boulevard to watch the complete ‘Sunset Seasons Greetings’ show. It’s another very entertaining one. 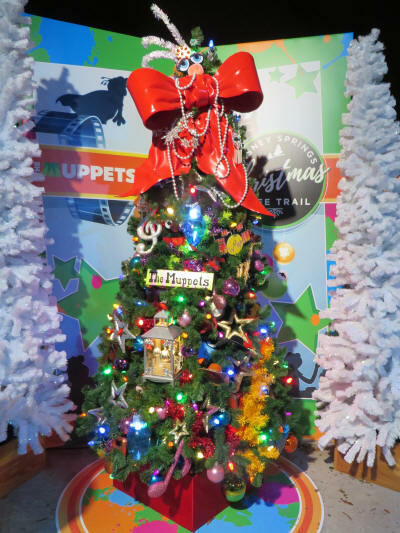 There are four separate vignettes, Toy Story, Muppets, Frozen and Old Fashioned Christmas. We left the park at 8:50 and made our way home. It wasn’t long before we were both soaking in the hot tub, easing our aches and pains. Aaaah! We were back to the room by 10:00 p.m. and after a bit of catching up on news and messages we fell into bed, contented after another great day! We were up this morning at 7:00 a.m. and relaxed over coffee until about 9:15. 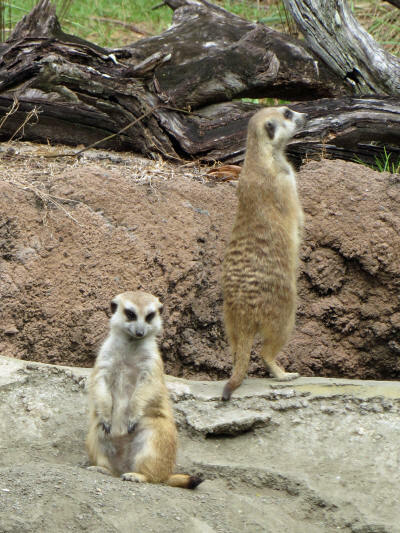 Then it was time to leave for Animal Kingdom to meet a group of fellow Disney fans. 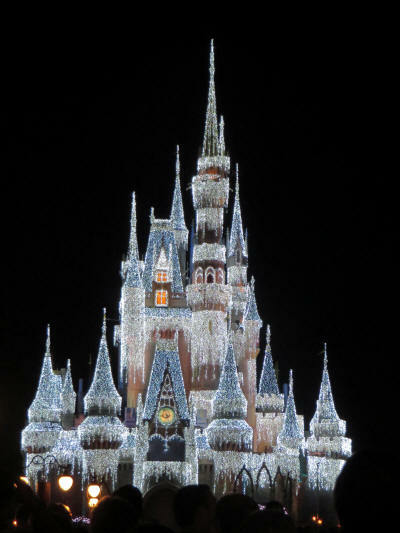 This was the reason for our ‘spur-of-the-moment’ trip to Walt Disney World. 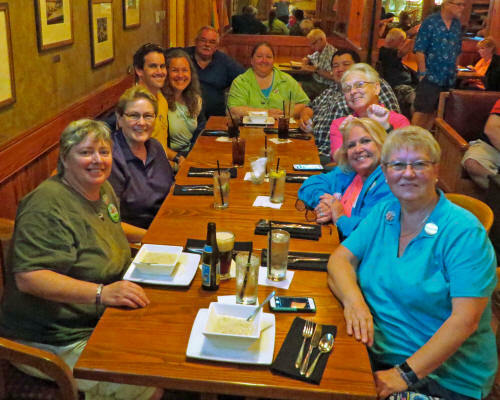 A small group of us were meeting to remember Barrie Brewer, a dear friend from Portland Oregon we recently lost to cancer. 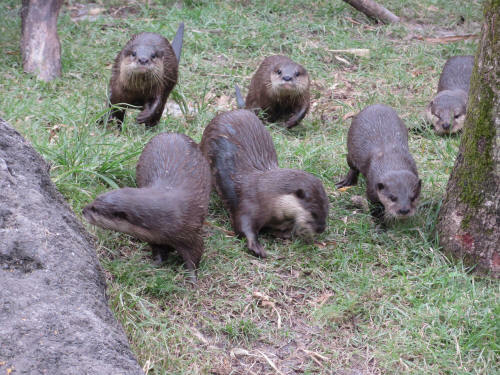 When we arrived at the park about 9:30 the otters were frolicking, a group of eight otters, chasing each other, rolling in the grass and swimming. Carol is always captivated by otters; they kept us amused for about a half hour. AT 10:00 a.m. we crossed over to Creature Comforts where we had a light breakfast while waiting for the group to assemble. They began trickling in at 10:15 and by 10:35 everyone had arrived. 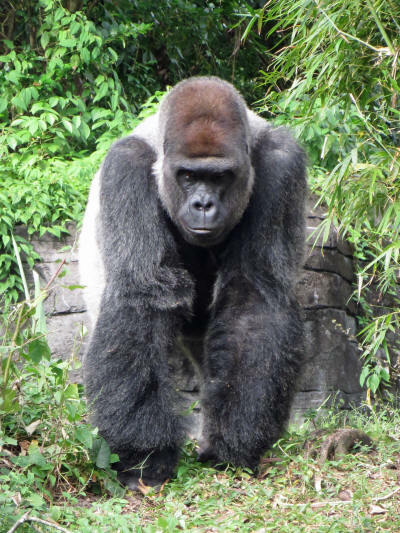 At 10:45 we began a slow walk through one of Barrie’s favourite places in the park, the Gorilla Trail. 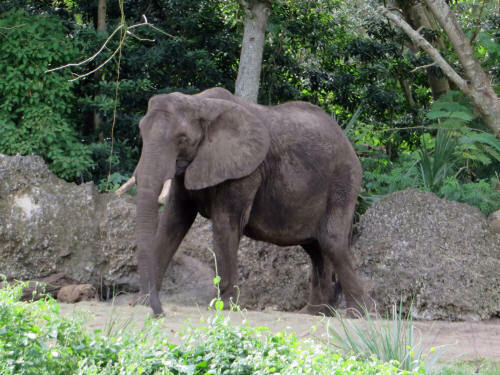 There were a number of the giant animals out and we had some great sightings, along with hippos, Meer cats, exotic birds, zebras and okapi. 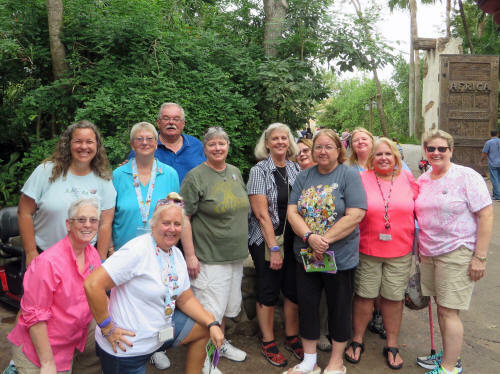 We completed our stroll through the gorilla trail at 12:30 and walked to Flame Tree BBQ where we all enjoyed a delicious lunch. Who knew that macaroni and cheese smothered with pulled pork could taste so good? We sat for quite a while after lunch sharing stories of our times with Barrie; Melanie had us in stitches with her tales of fishing at Fort Wilderness with Barrie. Neither of them was what you would call an ‘outdoorswoman’. Our group lunch and remembrance broke up 2:30 and everyone went their separate ways. 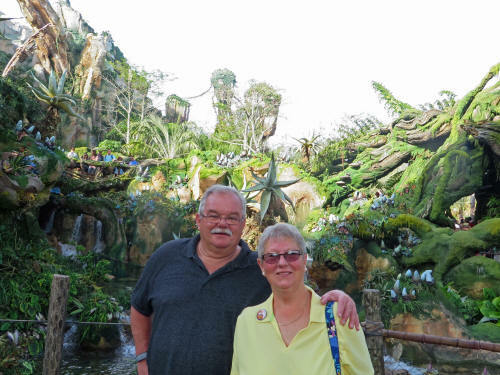 Carol and I headed to the Valley of Mo’ara and where we wandered, enjoying the exotic scenery, until it was time for our 3:20 p.m. FastPass+ at the Na’vi River Ride. We were glad to have FastPasses, the standby line was almost two hours long! It’s a cute ride but there is no way we’d wait in line more than 30 minutes. 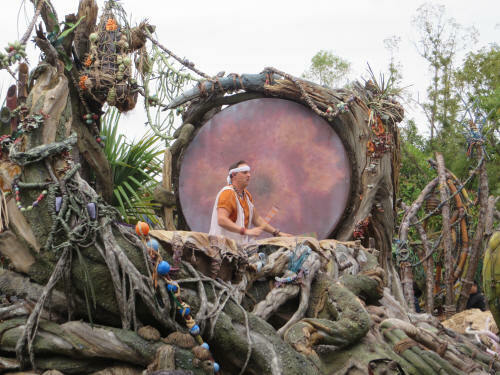 As we exited the river ride some drummers were playing in the Pandora courtyard. We stopped to watch the show and after a few minutes Carol noticed our friends Melanie, Brenda & Sutree sitting right there in front of us. I took Carol’s camera, walked all the way around to the opposite side of the courtyard there and took a ‘sneak picture’ of Carol photobombing the ladies. They didn’t notice us and were never aware we had been there . . . until they saw that photobomb picture later on Facebook! As the drummers finished we headed for home. We were back at the hotel by 4:00 and had a very short rest. In no time at all it was 5:00 and time for us to head to The Boardwalk for drinks and dinner, a continuing part of our memorial to Barrie. This time we were joined by Barrie’s sister Chris and her nephew Jessie. We all met at the Boardwalk’s Belle Vue Lounge for a drink, and after sharing more memories of Barrie and plenty of laughter, we caught the boat to the Yacht Club where we enjoyed a wonderful dinner at the Crew’s Cup Lounge. We chattered, reminisced and laughed until 9:30 p.m. It was a great time and a very fitting way to remember our dear friend Barrie! We arrived home just before 10:00, tired after a very satisfying day. We were up at 7:00 a.m. and I spent about an hour writing and publishing the previous day’s update to our trip report. Then it was time for breakfast which I ate outdoors, beside the pool. 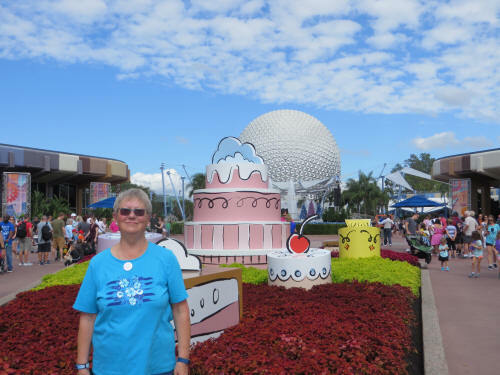 Carol was all set to go when I got back and we left for EPCOT at 9:00. There was no trace of a line at Spaceship Earth so we decided to forget about our 9:50 FastPasses - we rode it immediately. 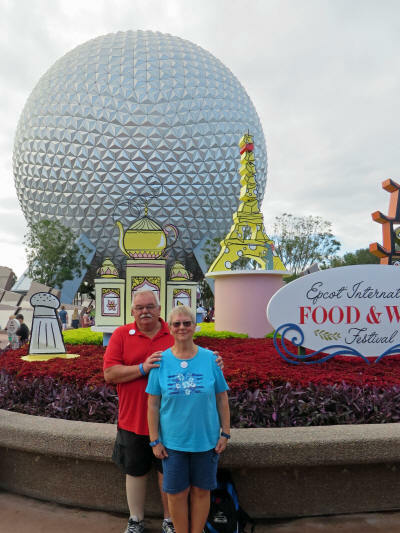 We strolled through Future World, past the shuttered remnants of Ellen’s Universe of Energy, to the Food & Fine Festival Event Centre, housed in the former Wonders of Life Pavilion. 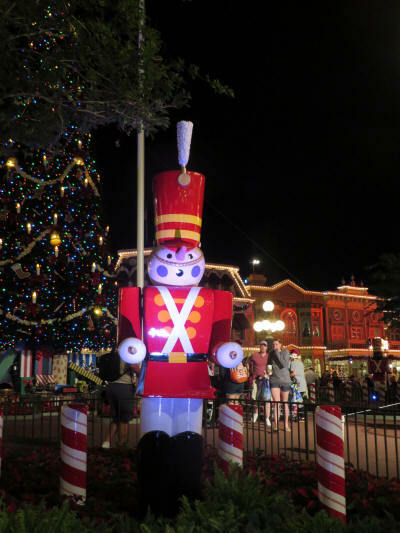 We took a quick look at a few exhibits, examined the chocolate sculptures at Ghirardelli, and picked up the special festival buttons available for Annual Passholders. This is made of nothing but chocolate! There are some amazing chocolate creations. 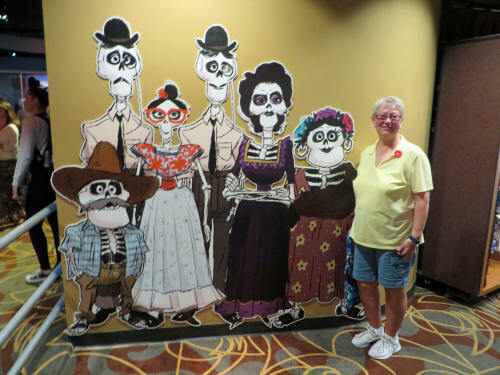 Naturally Carol stopped at Pin Central as we made our way toward Imagination to see the new Disney & Pixar Short Film Festival. It was cute, and gave a good insight into the creative minds behind all those successful Pixar films! 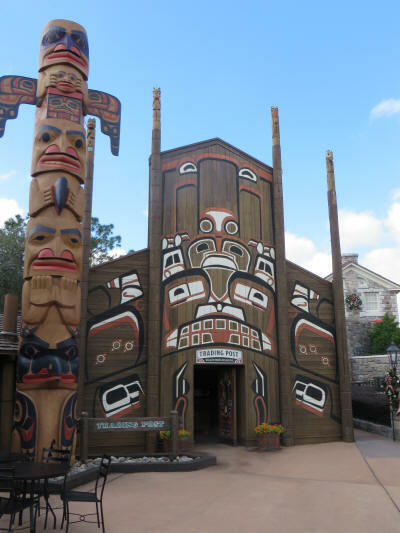 It was almost time to meet our friends so we headed toward World Showcase to hook up with them at Canada. Alas, the savory aromas at Flavors From Fire sidetracked us. We shared a sampler of the Smoked Corned Beef - it was excellent. 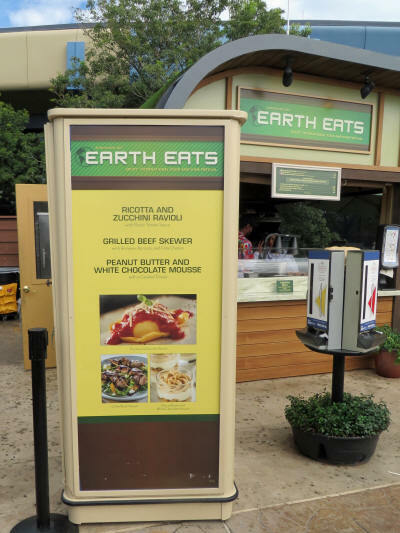 Just next door was Earth Eats where the Peanut Butter and White Chocolate Mousse caught Carol’s eye. It was yummy too! 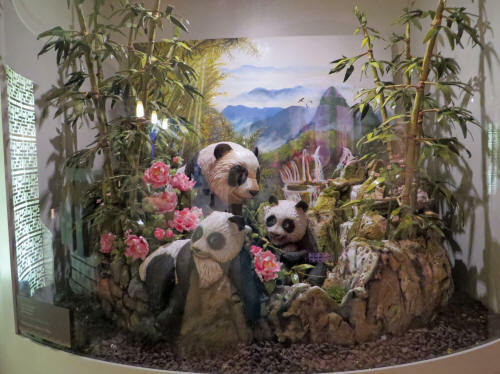 We didn’t want to overdo it before we met Al & Jane, after all, we were supposed to have lunch with them! We sat in front of the Mill Stage, near the Canada pavilion, and they arrived on time, at 12:00 sharp. The four of us walked through the rose garden to Active Eats where Carol picked up Loaded Mac ‘n’ Cheese. She enjoyed it, it was a bit too spicy for me. Next we shared Baked Shrimp Scampi from Coastal Eats. We’ll definitely have that one again! 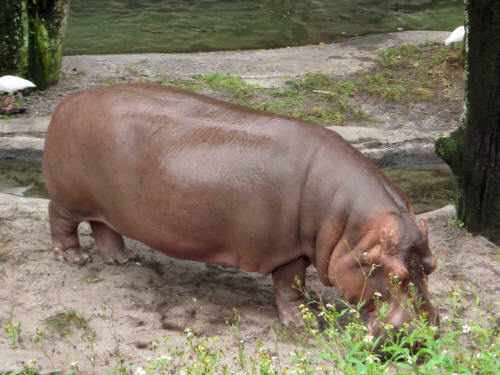 Carol wanted a dish from Thailand but the line was too long and didn’t seem to be moving. She soon gave up! Next came China. We always enjoy the Chicken Pot Stickers there, and so do Al & Jane. There was no sharing at China, we each ate a full order! We wrapped up our culinary tour with Warm Carrot Cake at Barley & Hops beside the Americal Adventure pavilion. That was it, we were full - our cronut will have to wait until tomorrow! Al & Jane were full as well and had to get home to their three cocker spaniels. We said farewell at 2:15 and dragged ourselves through the heat to the parking lot. We were home by 2:45 and enjoyed a well-earned nap. We left at dusk for our return trip to EPCOT. 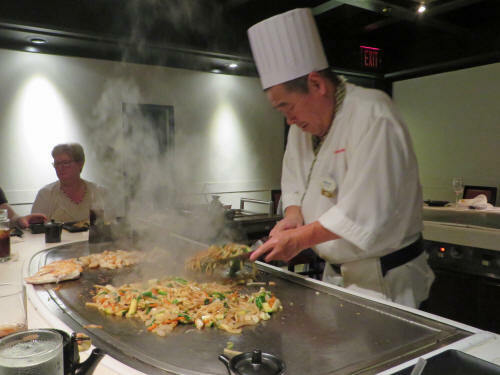 We had a FastPass+ for Soarin’ and a dinner reservation at Teppan Edo. 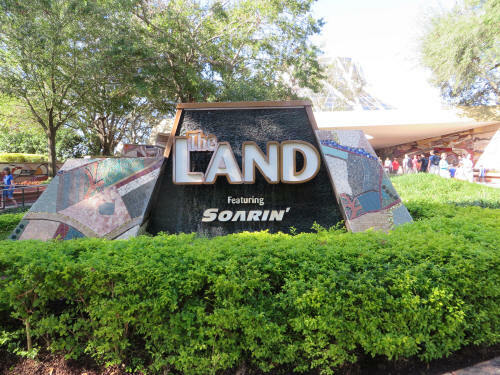 We arrived just in time to use our FastPass and once again enjoyed the sights, sounds and smells of the new Soarin’ movie. On the way to Japan for dinner we walked through the rose garden and Carol stopped at a few Food & Wine Festival kiosks to collect several more of the buttons they were giving out this year. She thinks she now has the full set. We took the boat from Canada to Morocco and then made the short walk to Japan where we checked in just a few minutes early for our 7:30 reservation. We were seated in just a few minutes and enjoyed chatting over dinner with a young couple, brother and sister, from Corpus Christi Texas. They said “Oohhh” when they heard we were from Canada, but we soon figured out that they were further from home than we were. 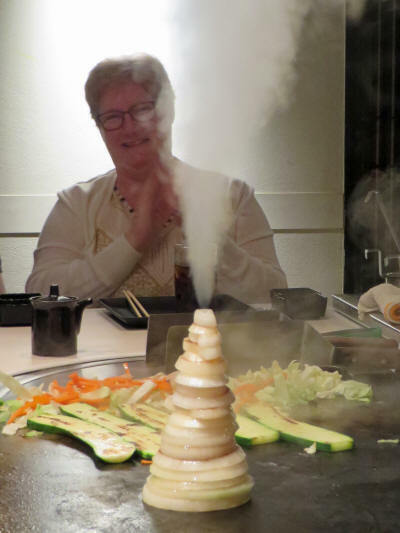 Once again we enjoyed a delicious dinner at Teppan Edo. The portions seemed a bit larger than we remember getting there before; neither of us finished the entire meal. When we left the restaurant at 8:55 the boats on the World Showcase Lagoon had shut down and we had to walk all the way around World Showcase. The fireworks show, Illuminations, was scheduled to begin in 5 minutes and we scurried, as best we could, toward the exit to beat the crowd. We heard the final salvo of fireworks just as we left the park and crossed the parking lot. We beat the crowd out and got home at 9:30 p.m. I went down for a soothing soak in the hot tub while Carol chilled in the room. We were both bushed after a busy day, bed came early. We were up at 7:00 a.m. and lingered over coffee in the room as usual. The Marriott provides a complimentary hot breakfast and I enjoyed it again this morning in a sunny corner beside the pool. 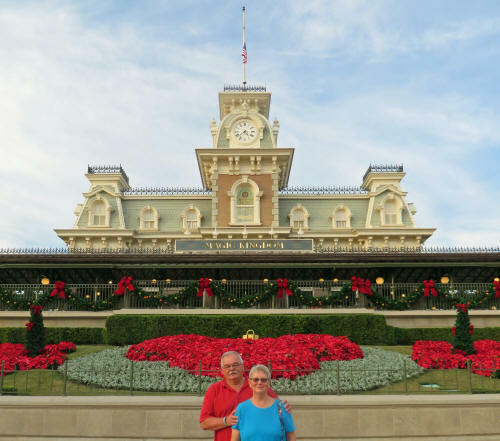 Carol was set to go when I got back to the room and we headed out to begin our final day at Walt Disney World. 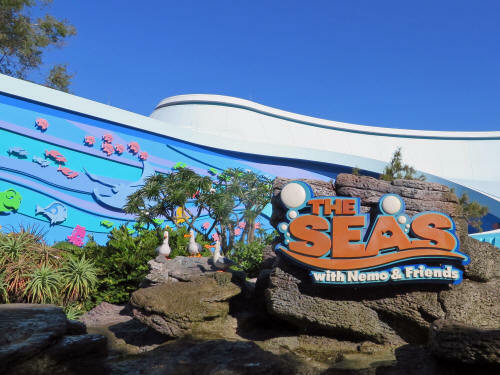 We arrived at EPCOT about 9:15 and headed toward Future World where we had a FastPass+ for The Living Seas With Nemo. 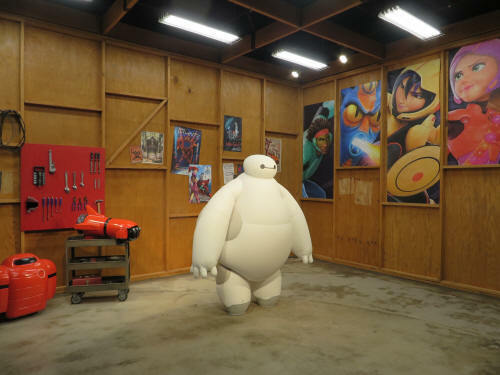 As we passed through the breezeway Carol noticed Baymax from Big Hero Six. 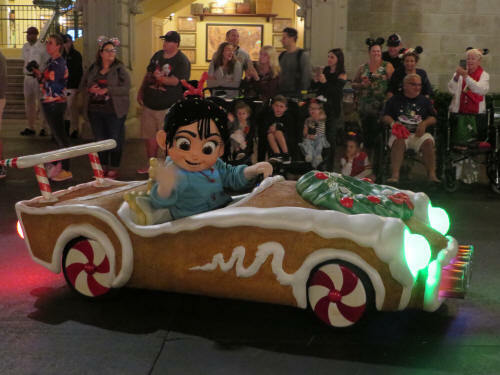 He was appearing at a Meet & Greet inside Innoventions. She snuck in the back door and got a picture while he was between poses with children. When we arrived at The Living Seas there was no line, so we skipped our FastPasses and went through the standby line. It’s a cute ride, not one we’d wait a long time to see, but we do try to see it each time we visit. 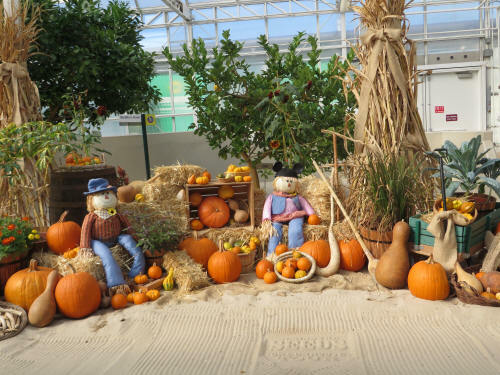 Our next stop was in The Land Pavilion where we had another FastPass+, for Living With The Land. 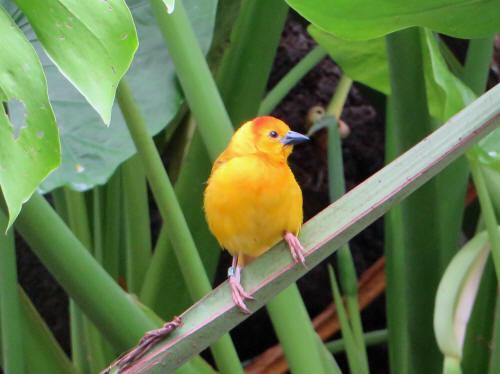 Once again we stepped into the Standby Line and took a boat ride through the greenhouses. We finished our rides in the two attractions before the scheduled start time of our first FastPass. We were supposed to meet a few of our friends from Tagrel.com at Sunshine Seasons for coffee and a snack at 10:30 so we found a table at about 10:20 and settled in to wait for them. Karen from Connecticut arrived at about 10:35 and we yakked awhile as we waited for the rest. Soon Carol received a couple of text messages . . . first there was a problem with the monorail. The second text told us about the problems with the ferry boat. The ladies were going to be a while! 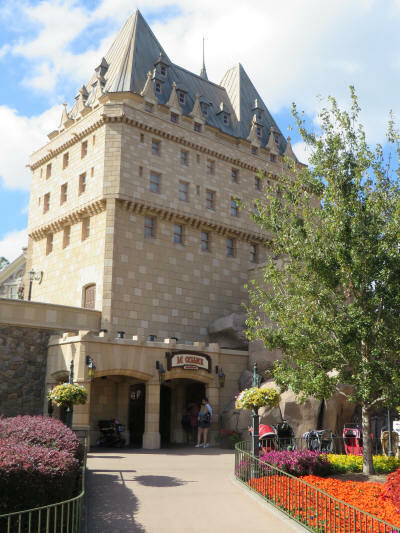 We agreed to meet them at Soarin’ at 12:30, then Carol and I headed to the Canada Pavilion to meet Curtis, a young man from Ontario who is working there on the College Program. It turned out that very little was working out as planned today. We thought Curtis’ shift started at noon and when he hadn’t shown up by 12:15 we started asking around. Dang! He wouldn’t be there until 1:00 p.m. and we couldn’t wait that long! 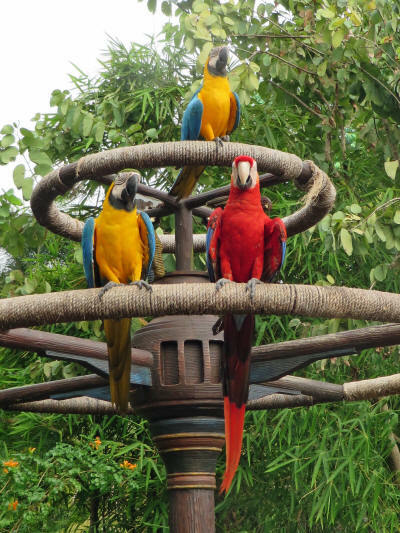 We headed back to Soarin’ and met our buddies Karen, Susan and Pam for a ride. We said goodbye to the Tagrel gang and headed to the exit. On the way home we made a brief stop at Property Control. I waited in the car while Carol shopped . . . she claims that she can shop a lot more efficiently when I am not lurking nearby. There must be something to her claim, she was back pretty quickly and she was empty-handed! We were back at the hotel at about 2:15 and as we entered the lobby our tummies reminded us that we hadn’t stopped for lunch. We sat for a few minutes at the poolside bar and shared a chicken Caesar wrap before we adjourned to the room for a nap. 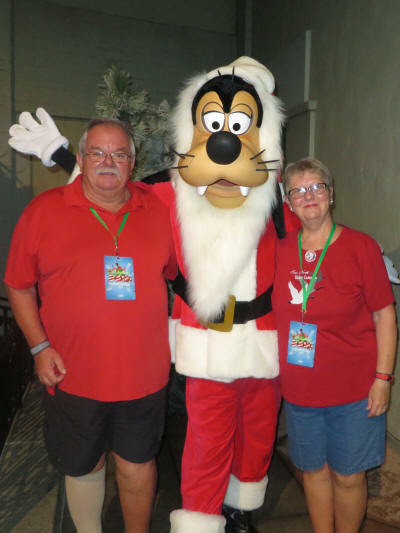 We’re heading home tomorrow so Carol did a bit of packing before we left for our last hurrah at Disney, dinner at Disney Springs. 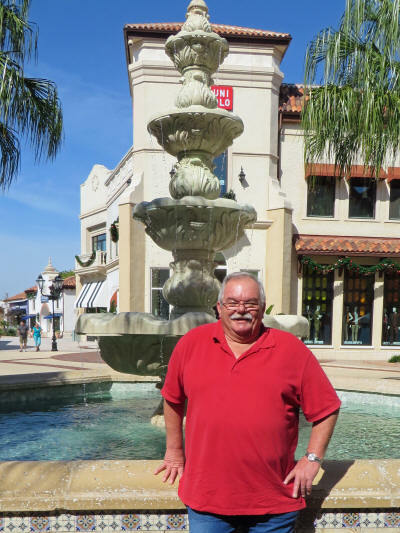 We had a 5:45 reservation at Chef Art Smith’s Florida Homecoming Restaurant. Carol ate there last August, but this was my first meal there. We checked in with the hostess at 5:45 and were promptly seated. We started with a half-order of their famous devilled eggs. They were good, but I agreed with Carol’s assessment from last August . . . I like my devilled eggs better! 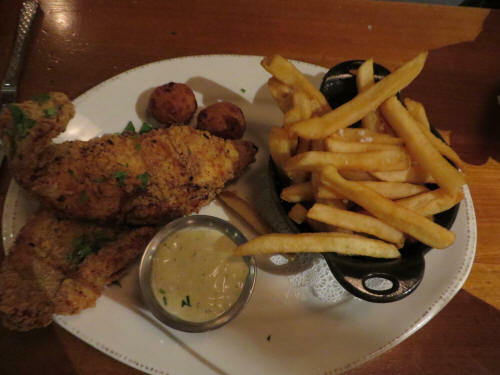 Carol had fried chicken and I had fried catfish. Both were yummy! We decided to share a slice of Hummingbird Cake and had just started it when someone started poking me in the shoulder with an umbrella. It was our friends Deb and Linda; they knew we were having dinner at Homecoming and came to say goodbye before we head for home. It’s always nice to see these ladies and it’s always tough to say goodbye! 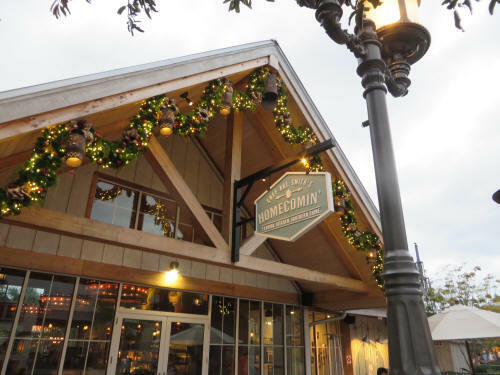 After dinner we headed across to the Marketplace area at Disney Springs. I found a comfy chair in front of Earl of Sandwich and read my book while Carol took a final lap through some of the shops. Once again she came back empty-handed. 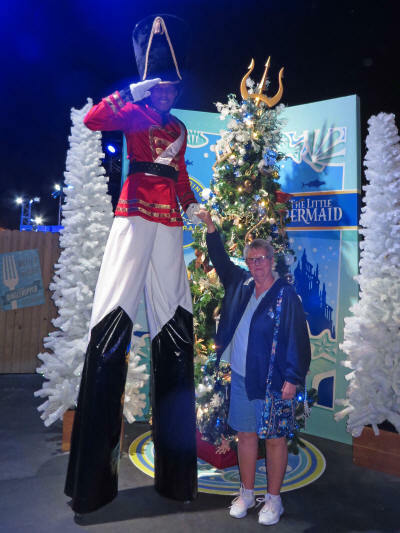 We headed over to the Christmas Tree Trail and were just about to start wandering through to look at the Disney themed Christmas trees when I felt another tap on my shoulder. This time it was Glen and Frannie, friends from New Jersey. 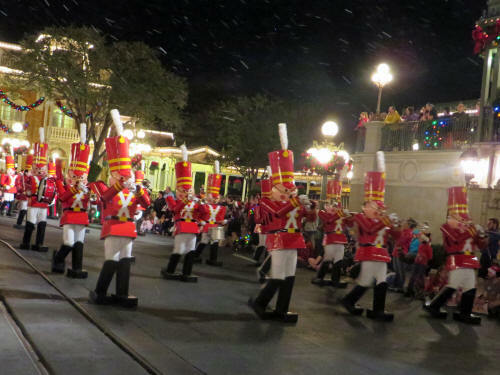 They had just arrived today and, like us, they usually have a bite at Earl of Sandwich as soon as they get there! 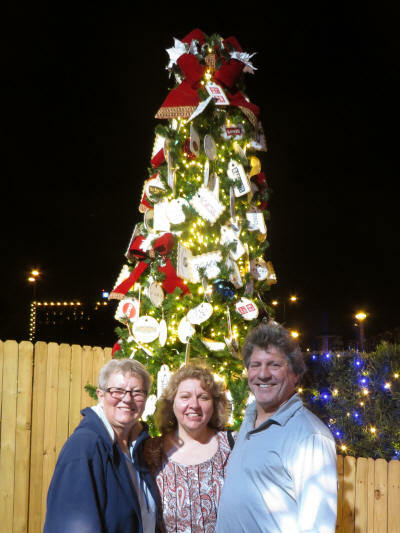 It has been at least four years since we last saw Frannie and Glen so we really enjoyed chatting with the as we wandered through all the lavishly decorated trees! It was about 8:30 when we came to the last of the trees. 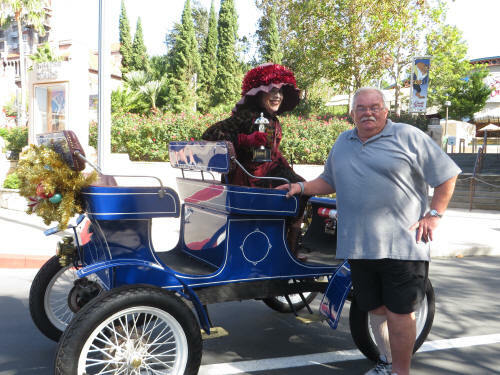 Glen and Frannie headed off to the Art of Disney store while Carol and I made our way to the garage and headed back home. Carol finished as much of the packing as she could and we hit the hay early. We’ll have a long travel day tomorrow! We're home, safe and sound after a very long travel day! Because this was a 'spur of the moment' trip and we booked it about 30 days in advance we couldn't get a non-stop flight home. We were up bright and early and headed to the airport at about 7:00 a.m. for our 10:00 a.m. flight to New York's JFK Airport. It was a smooth and uneventful two and a half hour flight to New York, there weren't even any screaming children on the plane. We landed a few minutes early, just before the scheduled time of 12:30 p.m. and that was good in a way, and bad in a way. The bad part? It extended our four-hour layover by a few minutes. Yup, you read that right - four hours! We whiled away an hour over a nice lunch in a sports bar, then headed off to our departure lounge for the rest of the afternoon! Departure lounges are not the most exciting places . . . YAWN! The final leg of our flight took off just a few minutes late but they made up for the delay on the 48-minute flight to Syracuse; we landed a few minutes early. By the time Carol and I had finished our latrine break the luggage was beginning to roll around the carousel and ours was one of the first bags to appear. Carol called the hotel where we had parked our car and the shuttle arrived in minutes. Traffic was light and we made great time. After a quick stop to fuel up on cheap American gas we crossed the border into Canada at 7:45 p.m.
We were home to three very excited dogs by 8:15. It was a great time; we sure are glad we were able to join with some wonderful people to remember our dear friend Barrie! Our next adventure is only two weeks away . . . we hope you can join us!